This colorful tabbouleh with sun dried tomatoes and roasted red peppers is a feast for the eyes. 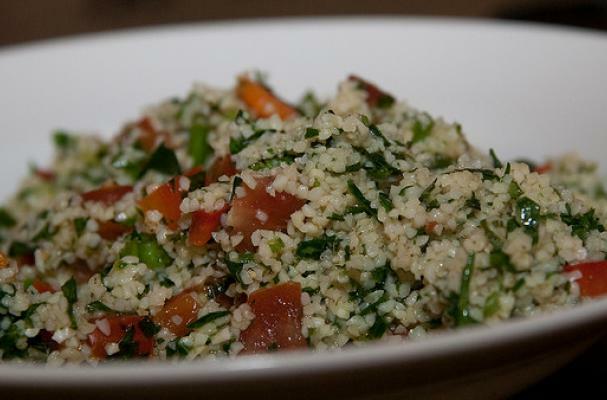 Tabbouleh is light and healthy salad that will help you achieve your weight loss goals this year. If you are having difficulty finding bulgur wheat, opt for quinoa or whole wheat couscous. Tabbouleh gets better as it sits so plan to make this dish in advance if possible. Tabbouleh with sun dried tomatoes and roasted red peppers is healthy done right- flavorful and delicious! To prepare the Bulgur, rinse it out a few times and drain. (Best to leave 1/4 cup water with the bulgur to help get moist.) Let it seat on a plate to get moist for about 30 minutes. To prepare the salad, combine the next 7 ingredients in a salad bowl. To prepare the dressing, combine the sun dried tomatoes, garlic cloves, lemon juice, red wine vinegar and process it until it forms a fine paste. Slowly add the olive oil, while the food processor is running. To serve mix the Bulgur, salad and dressing together. Add salt and Aleppo red pepper to taste.